The Great Gatsby era at your feet! 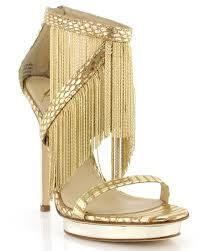 Gold and gorgeous, these platform shoes are by B Brian Atwood. Beautiful design and chain fringe detail. I bought these babies as Mother's Day present to myself. Mama needed a new pair of shoes to begin walking the "teen years" path. Yeah, whatever.